During the summer season many parents take the kids on a road trip. CBS News' Thalia Assuras got some tips for minimizing stress and maximizing fun from Eileen Ogintz, writer of a nationally syndicated column called "Taking the Kids." Keeping the kids happy starts with the packing. To get the kids involved from the outset, let them help you pack their suitcases. Or, let them pack their own, but check and make sure they don't just put in a T-shirt. Pack a separate beach bag so if you stop to swim, you're not rooting through all the bags. Take a cooler because picnics are part of the fun. You don't want to sit in a fast food place with them fidgeting. And, while they're eating, they can play. So, throw in their soccer balls or softball mitts. And don't forget paper towels to help you clean up the mess. Put a pile of pillows, blankets and favorite stuffed animals in the back seat. That's where the kids will be. 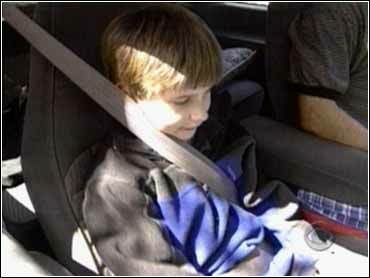 As soon as they're buckled up, hand them a roll of quarters to use for souvenirs. Every time one kid slugs another, take a quarter away. Take masking tape so they can mark off their own spaces in the back. It will prevent a lot of fights. When they're finished marking off their spaces, they can decorate their seats. Keeping them active is important. Don't forget stupid joke books. To help kids navigate, give each a laminated map to help mark the route. Encourage them to keep a travel journal so when they get bored, they can work on their notes. Give each child his or her own art stuff; you don't want them fighting over who has the red glitter crayon. Along with traditional items, take some of the newest and glitziest toys, such as video games or Star Wars toys. Consider individual tape players to keep the kids from fighting over the radio. Keep plenty of healthy snacks in the car. "When they go really nuts, I reach into my own special bag and pull out the surprise present," Ogintz says. Surprises and special snacks are good last resorts to have on hand. Remind yourself often what you're doing in the car in the first place - trying to have some fun and build memories. "You're going to be talking to your kids more on this trip than you've probably talked to them in a month. Tune into them and ask them what is going on with themselves. They'll tell you," Ogintz says. Ogintz recommends parents see the National Safe Kids Campaign Web site for information on installing car seats correctly and a list of upcoming car seat safety checks around the country.